Mersen Amp-Trap 2000® A4BQ Series Rejection current-limiting time delay fuse is rated at 600-Volt AC/500-Volt DC and 4000-Amps. Interrupt rating of this fuse is 200-Kilo-Amps at 600-Volt AC and 100-Kilo-Amps at 500-Volt DC. The class L fuse of dimension 5.63-Inch Dia x 10.75-Inch, has cylindrical GMG body and silver-plated copper contacts. It features pure silver links that ensure lowest let-thru current and improved fuse life. The easy 2-to-1 selectivity feature prevents nuisance shutdowns and blackouts. Fuse offers response time of 4 seconds at 500% rated load. 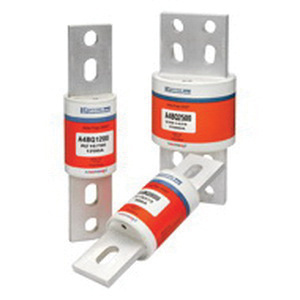 The high-grade silica filler of this fuse ensures quick arc quenching. It has high-visibility orange label for instant identification. Low voltage fuse with blade terminal connection, supports bolt on mounting. It is suitable for mains, feeders, large motors, lighting, heating & general loads, circuit breaker back-up, UPS and battery circuits. Fuse is UL listed and CSA certified.